Call 911 or your physician immediately if you believe you are having an allergic reaction to Celebrex. It is important that you receive medical attention as quickly as possible in the case of a serious complication. You should not take Celebrex if you have a known allergy to sulfonamides. In the case of a serious allergic reaction, anaphylactic shock may occur. If you have any of these symptoms, stop using Celebrex and seek medical attention immediately. In case of accidental overdose, seek medical attention and contact a poison control center immediately. If you think you or someone you know has overdosed on Celebrex, call 911 or your local poison control center immediately. 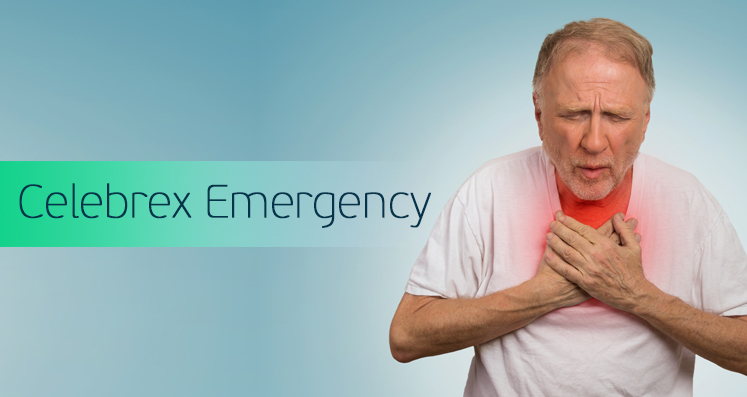 Celebrex has been associated with the increased risk of severe cardiovascular complications, including heart attack and stroke, especially when taken in large doses and for prolonged periods. If you have any of these symptoms, call 911 or your emergency physician immediately. Celebrex has been associated with an increased risk of gastrointestinal complications, including perforations (bleeding ulcers) in the stomach and intestinal lining, which can lead to death. If you have any of these symptoms, seek medical attention immediately. In rare cases, Celebrex may cause a severe skin reaction similar to that of a sulfa allergy. If you develop any of these symptoms while using Celebrex, stop taking the drug and seek medical attention. Celebrex may cause a condition called hepatotoxicity, in which ingestion of chemicals, usually medications, causes damage to the liver. The liver plays the role in the body of cleansing chemicals from the bloodstream; it is thereby at increased risk for damage by toxins contained in these chemicals. If you have any of these symptoms, stop taking Celebrex and seek medical attention. If you experience or witness a serious side effect or complication of Celebrex, the FDA urges you to report the event through its “MedWatch” service. Your report helps the FDA to gather more complete information regarding the safety of this drug, which could save other patients from suffering the same complications.